These traditional Konkani buns were in my draft for a very long time now. I agree, this should have been one of the early posts on this blog. Because this is very popular among Konkanis. But at my home, buns with pumpkin is more popular than these ones with bananas, although this version would made an occasional appearance. I have a strong aversion for banana flavor, though I eat bananas, its the aroma of bananas in any dish that bothers me. That was one of the reasons I took so long to make this dish. Then I got few requests for this version and also my cousin in law Shilpa(yeah we have too many Shilpas in our family) mailed me and asked to include this, which is her favorite dish. Though we don’t know how the name “buns” has originated, I feel one of our ancestors liked the normal buns and wanted to create it at home. But since the ovens were not part of Konkani kitchen those days, they might have started deep frying these. Just like the buns, these have the beautiful color from outside and very soft from inside. When you bite into these, it feels like biting into any other bread or bun. So finally I gave it a try. Though the original Mangalore buns are made of maida, I made these with wheat flour as we do with pumpkin buns. These buns require some “standing time” of about 1hr or so. So I made the dough the previous day evening and refrigerated it. These came out just perfect. I added both optional ingredients – pepper and cumin seeds, so the banana aroma was not too much overpowering. I think I will be making these more frequently now that my hubby really loves these and with pepper and cumin, even I can enjoy these :). These can be served on their own, which is infact the more popular way of eating these. But I served them with peanut chutney powder. Increase sugar if you like them more sweet. With 2tbl spns they become mildly sweet. Add sugar, salt, cumin seeds(optional), pepper(optional), soda and yogurt to mashed bananas. Mix well. Add wheat flour and mix to make dough. The amount of flour specified is approximate, add enough to make a stiff dough. Cover it and leave for about 2-3 hrs. (I refrigerated the dough overnight). Heat oil. (I used 1/2 peanut oil and 1/2 olive oil). Take small balls of dough and roll into small puris. Deep fry. I just love these mangalore buns. But we make it without bananas. I love to see the breadlike texture inside when you take the bite. I have never made buns ever (have just gobbled them happily!). but looking at your delicious post, i feel like making them now! Wheat flour is an excellent alternative to Maida. I think when I will make it I will use wheat flour too. Thanks! Shilpa..this was made at my place on very special days(wt maida though)! I absolutely loved them and wd have more than my stomach cd take 🙂 Tks for posting,shall try someday with wheat flour!But Pumpkin buns are very new to me..shall try them one of these days…tks!! I’ve had these at a Konkani friend’s home and they are absolutely delicious Shilpa! Shilpa… Never tried making with wheat flour and also adding both cumin and pepper. I usually add cumin or pepper. I make it one a week. My boys love them. Your picture look perfect !!!! How interesting that they have bananas in them. Looks tasty. I’ve never tasted this yet.. but my dad who has tasted them likes it a lot. Hi! at my place these puris used to be a regular feature n we used to call it as bhubus rotti. I think we can roll it in thick rotis and fry on both sides like parathas. will consume less oil. with wheat flour it wll be nutricious too. Thanks, Shilpa…for once again taking back to my childhood, when my mom used to make them on our return from school..She calls them “Bun Poorie”.. She made them without bananas, but what a treat to come home too !! The pumpkin bun pooris were weekend night dinner treats!! Not a day goes by without my checking up your site..keep them coming, Shilpa -great pics too.. I like this buns very much.. i made it last week.. Ur picture looks perfect.. Yummy..!! These remind me of my honeymoon with Bhat Travels…. the Muslim cook, who was surprisingly an expert on North Canara dishes and seafood had prepared these for breakfast, and they were happily gobbled down by every1 and appreciated. Shilpa: Thanks Komal. Tausalli is already there on the site. As I am also from NK, its very common at my home :). Ok!! great to see that…i thought that was lost with time…. Perfect! 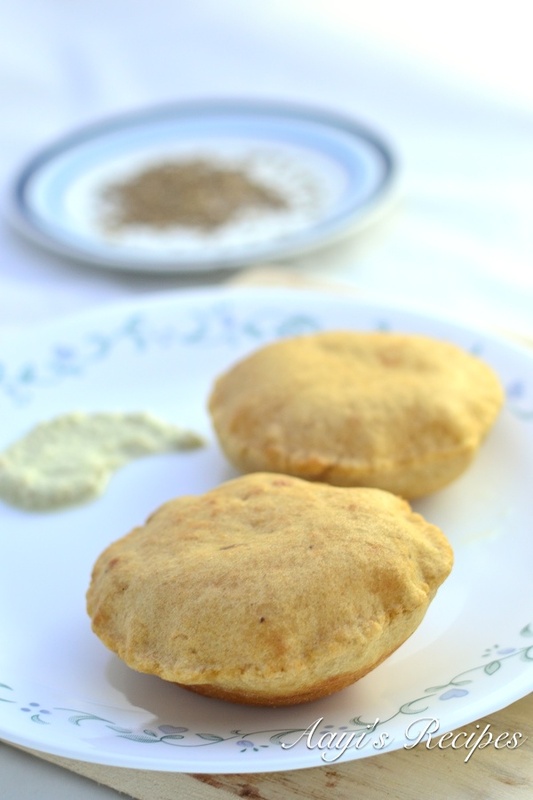 I made a similar poori awhile back, and received a few suggestions to try these; yours look so good that I will be making a point to try them soon, as I have saved ripe bananas in the freezer that need using. Plus, I bet these would bring some cheer to the winter weather! Thanks. Shilpa: Okay..I will wait for your experience with buns :). I think u will also love them with peanut chutney pitto. Thanks shilpa for the recipe with wheat flour. So far I used to prepare with maida. You can also add 1 tbsp of honey and 1tbsp of besan for an additional aroma and colour. Smear oil to the dough which does not allow the dough to get dry. Hi! I did make thick chapatis like parathas, taste good and served with mint chutney. hi dude i gone through your receipe, really its good, i’ll try to make out….. I tried it making a slight change. I used equal proportions of wheat flour and maida flour. Also, I kept the dough overnight. I did not refrigerate it. I dont know why but I never liked buns earlier. though my mother used to make them often, i always used to eat it just because my aayi had made them for me for my breakfast. Now, after marriage, I just came across this recipe, and felt like trying it for my husband. Now i have started liking buns 🙂 shall make them regularly. Also, the size of the balls of the dough to be taken to roll should be approximately how much we take to make chapathis and u gotto roll them to the size of puris. Thanks for this recipe . This is something which I enjoy whenever I visit Karnataka coastal. Since we are not konkanis , we usually eat this at our favourite eateries.They serve this with vegetable saagu and I request you to post the recipe for the same if you have. Saagu with this is a perfect combination. Shilpa…..I remembered those days when i used to go to my grandmothers place in udupi.I tried these at home and my husband liked it a lot.Thank you. shilpa.. I have been going through your site several times on several occassions since last one year.. and I always found what I wanted . Thanks for the extensive recipes.. and I love Buns the most.. just started to look for it and happy to see it here !! just came across the blog while surfing, and what a awesome discovery. it is a fabulous site for all GSB/NKGSB folks or anyone for that matter.great work. I was looking for the recepie to prepare buns i was just wondering if the home made buns comes out like the hotel once? I actually prepared the dough as given and i refrigerated it but i could see the next day morning when i removed from the fridge some black spot shere and there. I threw the whole dough thinking it was spoiled. could you please tell what is the reason. Shilpa: Usually when you keep banana in fridge, it becomes black. Same with this dough too. If you have use it next day itself, it will be fine. I was looking for the recipe like this to prepare buns, I just prepared it at home, and the buns came out like the hotel once? It was tasty, I will try again, after 2 days. I tried this recipe for Mangalore buns, they turned out very hard :(. Could you tell me where I went wrong? The procedure as follows. Ingredients: everything you mentioned except cumin seeds and black pepper. Quantity: wheat flour 2-cups rest everything as you mentioned. I kept the dough overnight and dough I prepared was chapathi dough consistency. Buns after frying was not soft. The buns that i tasted, back in India, were soft and thick like a bread and the ones I prepared puffed up like puris but were as thick as chapathis and were very hard. shilpa: Did u roll them too thin?Did u use soda? They were about 0.5cm thick. Yes ,added soda(almost 1/4tsp). Tried the buns yesterday with wheat flour. I also left the dough refrigerated overnight. Next morning, fried them. The first few turned out fine. Very crisp. But not all puffed up like puris. After they cooled down, they became hard and rubbery. The taste however was super. I tried to use as little flour as poss for dusting the puri while rolling them out. What do u think went wrong. Btw. tried to look up (unsuccessfully)how much your cup measures. 240 ml or 200 ml. Where can I find the measuring chart on this blog. Pl help. Thanks. I just came back from Kukke subramanya, We went to this Neo Mysore restaurant there and Ate Buns. awesome is the word!! This really looks yum! I will try to add some crushed fennel seeds (saunf) instead of the cumin. That has a slightly sweet flavor. Can’t wait to try this for brunch this weekend! Thanks for this recipie ,ivl try to make out at home hereafter rather than getting from hotel . I love to eat buns along with seera, its a good combination . I am sure you would have read this in Jaya v Shenoy’s book. the same dough can be used to make Bastad rotis. whenever i prepare buns it doesn’t pop up. how come? last time wen i prepared i din’t have curd so missed it ..is it bcoz of that? i got the proper puffed up buns only once for the first time i prepared but now i am not getting that. Plz help me shilpa. tnk u shilpa will use curd and soda for sure next time…….tnx a lottttttttttt dear. I have tried ur recipes and have received lot of appreciation from my family. Could you please help me with some microwave recipes? I tried making it but my dough become very very soft. so I couldn’t roll it.. please give tips how to manage when dough become extra soft after fermentation. I think you should try this recipe exactly. I have made it with exact measurements many times. Shilpa, I tried this over the weekend… they came out really, really great. The buns were soft and puffed up. The dough was more than I wanted… I kept the dough out for 3 days and nothing happened to it. I put in a bit of haldi powder so they had a nice golden colour. If I want to make it for a banana hater what can I substitute the mashed banana with? The flavour of banana is quite strong. Shilpa thanks for the lovely receipe. Since I have a sweet tooth, I will surely try this. My mom is from Udupi and she is an expert making these buns….If you ever go to Udupi u can try buns in the Hotel NCR near the bus stand….they really make some good buns with banana’s…Cheers..
shilpa thanks for dis recipe. Ill try them very soon as my hubby loves them. we stay in Abu dhabi and we dt get this things here.so I want to make it at home. thanks. Shilpa, thanks for the yummy recipe. Both my kids loved it. Shilpa,, how long can we store these buns without spoiling ? Deepa, these are eaten fresh. Never tried storing them.